Since axolotls absorb water and oxygen through their skin the kind of water that is used in their homes is very important to their health. Many people may not realize that there is a difference between distilled, bottled, tap and other kinds of water but the differences are a big deal and do matter. It may not sound important but the kind of water you use to keep your pet axolotl wet can play a big role in his overall health. Believe it or not, the types of water you get from your tap, fridge, bottles, jugs, and outdoor stream are all different and some are safer than others. Minerals and salts are necessary for the water you choose while chemicals like fluoride and chlorine are not. A neutral pH of 7.0 is ideal while a pH under 6.5 and over 8.5 is unsafe. 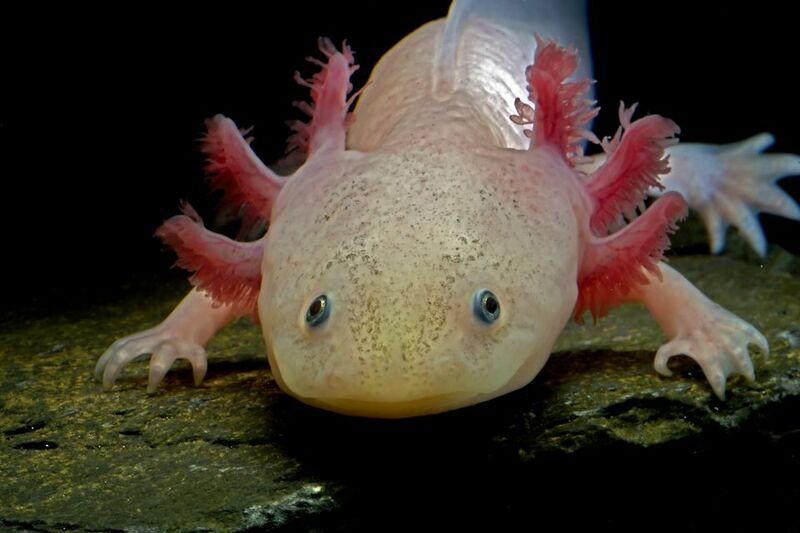 Axolotls, like salamanders and newts, need the minerals that are found in natural water and include sodium chloride, potassium chloride, and others. Bottled water is typically spring water that is treated but then has these natural minerals and salts added in. Bottled water is the safest type of water to give to your amphibian and you don't have to alter it in any way. Read the label of the bottled water to make sure it isn't really distilled water and that it has been treated by reverse osmosis, filtration, or another kind of process to remove chemicals. Watch Now: Axolotls are Cute, But Do They Make Good Pets? Depending on what country you live in and what city, state, province, or district filtration practices occur, the contents of your tap water can vary greatly from place to place. If you use your tap water for your pet then you need to either let the water sit for 24 hours to let the chlorine dissipate or remove the chlorine with special de-chlorination drops (like DeChlor) you buy at the pet store. Some cities now use chloramines instead of chlorine in the water which can be harder to remove. Check your water bill to see if it is listed or call the water department to see if the water is aquarium fish safe. If you aren't sure you are better off not using tap water. If you use well water instead of city water in your home you may or may not be able to use it with your axolotl but you will have to test it to find out. Some well water is too high in iron or has an inappropriate pH for amphibians. Other times it is not properly oxygenated. The pH can be tested using test strips in the aquarium section at the pet store to make sure the water is about 7.0 or neutral and the oxygenation and iron concerns can be resolved by aerating the water. This can be done with the use of a simple aerator sold in the fish department. You should never use distilled water with your pet. Distilled water has none of the important minerals and salts that amphibians require from their water, has more hydrogen than tap water or bottled water, and has an acidic pH (less than 7.0). All of these variations make distilled water unsafe for your axolotl to soak in, swim in, and drink. If you don't like the idea of purchasing bottled spring water, you don't have a reverse osmosis system in your kitchen sink, and have no filtration system like a fridge filter, Brita, PUR, or ZeroWater (with some brands doing a better job of chlorine and other chemical removals than others), you should either purchase de-chlorination drops from the aquarium store, boil the water and then let it cool, or allow your water to sit for 12-24 hours before putting it in your axolotl's enclosure. If you are still concerned that there is chlorine in the water you can purchase test strips to check the level prior to use.